So, you’ve decided you want to enrich your life with some permanent relaxation and are ready to add a hot tub to your home. Now the question is what kind of hot tub should you get. It’s no secret that hot tubs are an expensive investment, so before you can take the plunge, you should carefully consider all options and find one that will satisfy your needs and space requirements. This can be a bit overwhelming for someone who has never made such a big home improvement step. As you go around and compare small and large hot tubs, here are some things you should consider. 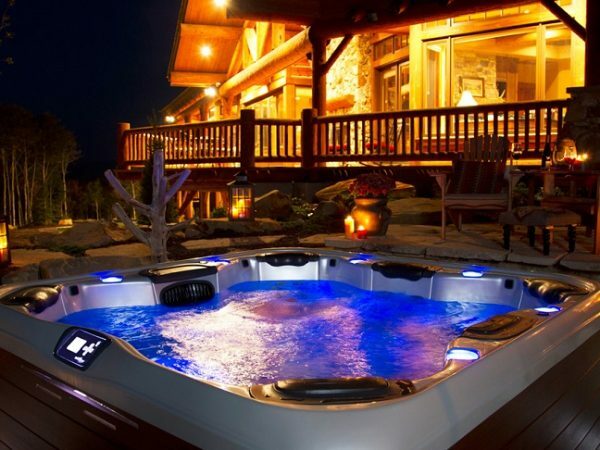 What is the ultimate reason you’re getting a hot tub, and be honest? Want to impress the neighbours – install an outdoor one, it’s sure to get heads turning! Would you like to share it with friends and family – make your pick from the wide selection of large hot tubs! With models ranging from 5 – 8 seats, these tubs offer plenty of room for everyone. Plus, a large outdoor spa can also be the centre point of some hellishly awesome summer parties. On the other hand, there are also models that can accommodate one person if having some alone time is the ultimate relaxation for you. Or perhaps you’d prefer a 2 person hot tub where you can have some romantic time with your partner, sipping on champagne – it’s sure to get sparks flying. If you have a bathroom with plenty of free space, a smaller hot tub can fit right in. Large hot tubs, on the other hand, are best suited for yards, decks or balconies. If you want a quality spa that will be your relaxation haven for many years to come, look for one made of the durable acrylic shell material. Acrylic has anti-scratch properties and is also resistant to moisture, cleaning chemicals, and the elements. This is especially important if you’re planning to use the hot tub outdoors because the material has great resistance against corrosion and can prevent mildew from forming. If you truly want to get durability for your money, also look what hides underneath. Unfortunately, some hot tubs are still built with the same design from the 70s and 80s – being supported by wood frames on the inside. If you apply enough logic, you’ll realize this is bad practice, since wood absorbs moisture. However, hot tubs have come a long way since then, and today you can find models with an ABS sealed base which provides a sturdy, impenetrable foundation that acts like a seal, preventing heat from escaping and keeping moisture out. If you want your hot tub to help the environment, while also helping you save some money, pay attention to how insulated it is. A well-built hot tub should have full foam insulation in order to prevent the heat from escaping easily and keep the water warm longer. Also, consider the quality of your spa cover. Does the material offer good insulation, and does it fit over the hot tub for optimal energy conservation. In addition to this, plumbing can also affect your energy savings. How so, you ask? Well, if there are more pipes involved there will be more energy used in order to pump water to the jets. Therefore, look for a model which requires a minimal amount of plumbing.